In recent years it became clear that people with diabetes face an ominous prospect – a far greater risk of developing Alzheimer’s disease. Now researchers at The City College of New York (CCNY) have shed light on one reason why. Biology Professor Chris Li and her colleagues have discovered that a single gene forms a common link between the two diseases. They found that the gene, known to be present in many Alzheimer’s disease cases, affects the insulin pathway. Disruption of this pathway is a hallmark of diabetes. The finding could point to a therapeutic target for both diseases. The researchers report their finding in the June 2012 issue of the journal Genetics. "People with type 2 diabetes have an increased risk of dementia. The insulin pathways are involved in many metabolic processes, including helping to keep the nervous system healthy," said Professor Li, explaining why the link is not far-fetched. Although the cause of Alzheimer’s is still unclear, one criterion for diagnosis of the disease after death is the presence of sticky plaques of amyloid protein in decimated portions of patients’ brains. Mutations in the human "amyloid precursor protein" (APP) gene, or in genes that process APP, show up in cases of Alzheimer’s that run in families. In the study, Professor Li and her colleagues scrutinized a protein called APL-1, made by a gene in the worm Caenorhabditis elegans (C. elegans ) that happens to be a perfect stand-in for the human Alzheimer’s disease gene. "What we found was that mutations in the worm-equivalent of the APP gene slowed their development, which suggested that some metabolic pathway was disrupted," said Professor Li. "We began to examine how the worm-equivalent of APP modulated different metabolic pathways and found that the APP equivalent inhibited the insulin pathway." This suggested that the human version of the gene likely plays a role in both Alzheimer’s disease and diabetes. They also found that additional mutations in the insulin pathway reversed the defects of the APP mutation. This helped explain how these genes are functionally linked. The APL-1 is so important, they found, that “when you knock out the worm-equivalent of APP, the animals die," Li explained. “This tells us that the APP family of proteins is essential in worms, as they are essential in mammals,” like us. Professor Li and her colleagues hope that this new insight will help focus research in ways that might lead to new therapies in the treatment of both Alzheimer’s disease and diabetes. "This is an important discovery, especially as it comes on the heels of the U.S. government’s new commitment to treat and prevent Alzheimer’s disease by 2025," said Dr. Mark Johnston, editor-in-chief of "Genetics." "We know there’s a link between Alzheimer’s and diabetes, but until now, it was somewhat of a mystery. This finding could open new doors for treating and preventing both diseases." Each intersection offers a possible target for drugs and other treatment. Professor Li plans to continue down the pathway, mapping its crossroads as she goes. Professor Li conducted the research with then CUNY Graduate Center – City College graduate student, Collin Y. Ewald, and research assistant, Daniel A. Raps. The research was funded by grants from the Alzheimer’s Association, the National Institutes of Health (NIH), the National Science Foundation (NSF), and a NIH Research Centers in Minority Institutions grant to The City College of New York. GENETICS a peer-reviewed, peer-edited journal of the Genetics Society of America (GSA), one of the world's most cited journals in genetics and heredity. C. Y. Ewald, D. A. Raps, and C. Li. 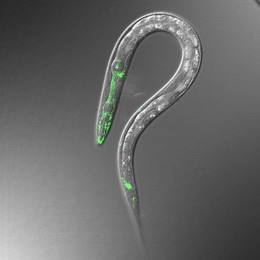 “APL-1, the Alzheimer’s Amyloid Precursor Protein in Caenorhabditis elegans, Modulates Multiple Metabolic Pathways Throughout Development,” Genetics, June 2012 Volume 191, Issue 2.